A 6.9-magnitude earthquake struck Indonesia's Lombok island on Sunday. This comes as the island is still trying to recover from another quake two weeks ago that killed more than 400 people. "The daytime quakes caused landslides on the slopes of Mount Rinjani, an active volcano, and panic in villages. Video shot by the Indonesian Red Cross showed huge clouds of dust billowing from the mountain's slopes. "The National Disaster Mitigation Agency said one person died from a heart attack during the biggest of the daytime quakes and nearly 100 houses near the epicenter were severely damaged. "The shaking from the daytime quakes toppled motorcycles and damaged buildings in Lombok's Sembalun subdistrict, including a community hall that collapsed. 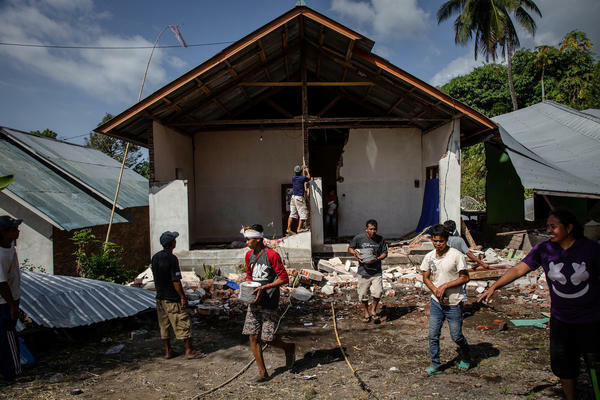 The hall had sustained damage in earlier quakes, said disaster agency spokesman Sutopo Purwo Nugroho." These earthquakes come as the island is still trying to recover from another 6.9-magnitude quake that struck on Aug. 5. That quake killed at least 460 people, injured more than a thousand others, and toppled many homes, turning buildings into piles of rubble. Another 6.4-magnitude earthquake on July 29 killed at least 16 people and injured more than 100 others.